Shiori is just a quiet girl taking time off from school because she's sick - it's just a cold, but it's rather persistent for that... Her classmates say she's been absent from school for around eight months. Sometimes, she lingers around school in her trademark shawl, wandering among the snow as if searching for a nostalgic memory. 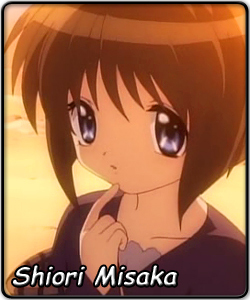 At first, Shiori wouldn't tell Yuuichi her last name, but when he finds out that it is Misaki, he begins to ponder about her relationship to Kaori Misaka. However, Shiori would not say anymore and Kaori vehemently denies any relationship to Shiori. Later on, she tells Yuuichi that she comes to school to meet someone that she knows. What could be the history behind this mysterious girl? Her favourite food is ice cream and she cannot handle anything spicy. Unlike some girls, Shiori can deal with Yuuichi's constant teasing without blowing her composure. Overall, she is always amiable and a bit quiet, but she doesn't give off an air of timidity. Sometimes she closes off when Yuuichi asks her more about herself and often tries to change the subject or walk away, promising to meet him another day. "They're called miracles because they don't happen." What, or whom, is Shiori searching for?